​Be part of this vital conservation project which aims to protect and preserve the depleted populations of sea turtles on the Caribbean coast of Costa Rica. ​A challenging but hugely rewarding experience awaits you as you play a role in all project activities. ​You’ll join night-time beach patrols to ensure the protection of nesting turtles and her eggs, you’ll work in the hatchery and you’ll be part of important data collection and general beach clean-up activities. This unique and isolated tropical location is where rainforest dwellers like sloths, monkeys and raccoons meet aquatic wildlife such as manatees, freshwater dolphins, crocs and of course turtles !! Nowhere better exemplifies Costa Rica’s “Pura Vida” – pure life. 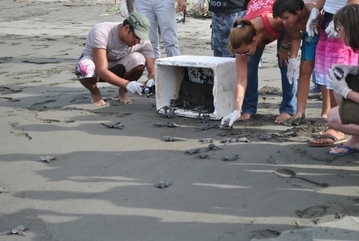 * if you want to work with sea turtles during the nesting off-season, then ask about our other project in a different area of Costa Rica which focusses on the research and protection of mature turtles through in-water monitoring, field rescue and the operation of a rehabilitation centre. This location also has the advantage of a choice of comfortable, private-room accommodation.